My running partner (RP) for the Rock n Roll DC Half Marathon, has a “thing” for firsts. Regardless of the actual start time of any running event, triathlon or skate-a-thon, my RP would arrive somewhere between 3AM and 4AM. In the darkest of dark hours that felt like “O-Dark-you’ve got to be kidding me”, my RP had a need to be 1. First in the parking lot. First to use the porta-potties. First to line up at the starting gate. First to wipe away the pixie dust. And no, we are not elite athletes. We like to finish, and are quite happy if there are others left on the course. In a tradition of firsts, my RP recently had a birthday. Not just any old birthday, but a birthday that puts you in a new age group for runners. An age group where “slow” doesn’t really matter. An age group where you place consistently in the top 10. An age group that I will soon be arriving. An age group where wisdom trumps over old habits, where PR’s occur just because you showed up, and spontaneous combustion resembles not caring who sees you dancing in the streets. If this is the aging process – bring it on! 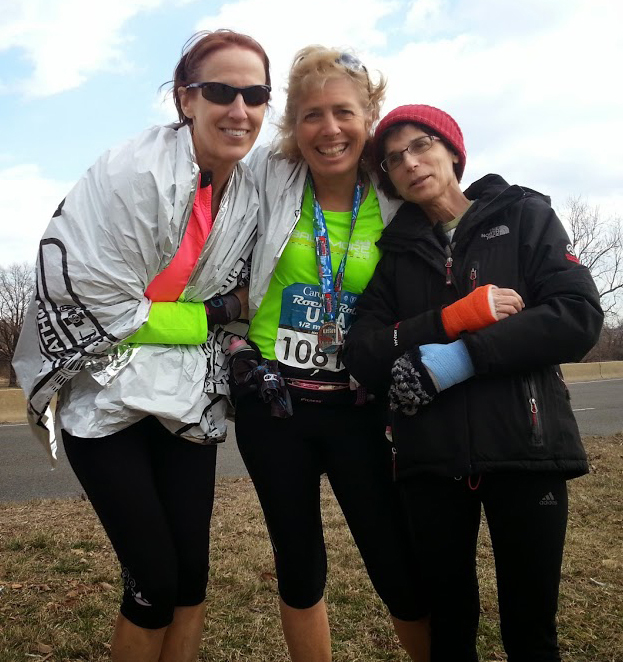 Fast forward to March 15 – and my RP and I found ourselves arriving at the start line of the DC Rock n Roll Half Marathon…not 4 hours early, not 2 hours early, not when everyone else was showing up….but 20 minutes AFTER the start gun! By oversleeping just a tad, adding extra time waiting for the DC metro to arrive, and miscalculating the distance between the metro and the start line — we arrived to discover that our designated waves were long gone. Yet, there were still many waves of runners waiting to start. We stepped off the sidewalk, onto the street and within seconds we were running. There was no time to wait for the GPS to find a satellite, use the bathroom one last time, make clothing adjustments….just run. No stress, no maintenance – just start moving! Who knew it could be thi s easy? We ran with many many thousands of runners. We ran on a bridge over the Potomac River, ran through Rock Creek Park, up an enormous hill with Medics conveniently located along the way. We ran near Dupont Circle and through sections where the crowd support was deafening. We ran toward the US Capitol on North Capitol Street, and ran along a vibrant array of ethnic neighborhoods along H Street. Allowing ourselves to be distracted by runner conversations along the way (we are too winded to make our own words! ), listening to mile after mile of bands playing motivating music, we absorbed the amazing run vibes in total awe of the “finally” spring like 60 degree temperatures. 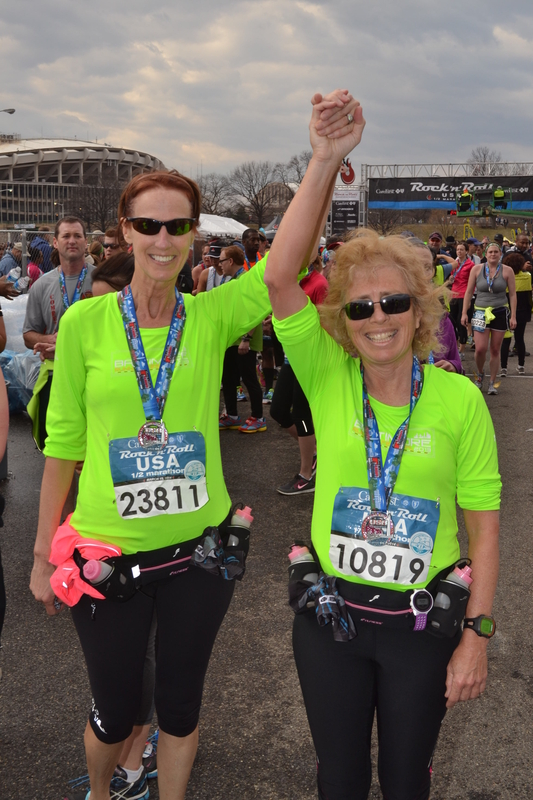 Before we had a chance to wonder “is this over yet?” — we had arrived at the finish line near RFK Stadium! A truly enjoyable run through the neighborhoods of DC. We then casually discovered while collecting race finisher food and drinks, that my RP had just PR’d! But wait, there’s more! It was time to cheer on the marathon runners making their way to the finish line. Here, we found the Touche Band playing just before Mile 26 – and discovered that there was still some juice left in our legs. Joined by trisista Tamar (in double wrist casts) who walked for 2+ hours to meet us at the finish, and trisista Emma – who can run and talk at the same time (obviously younger age category) – we discovered a second boost of energy, and spent the next hours cheering on those who ran the full 26 miles — turning the finish into a street dance party. Spontaneous combustion style.